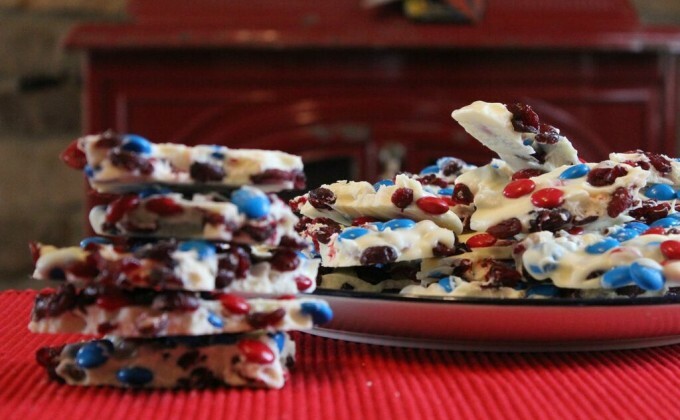 Sprinkle 3/4 cup of cranberries and 1 cup of M&M's on your temp-tations® silicone baking board. Set aside. Place 3/4 of the white chocolate in a large microwave safe bowl. Heat in 45 second increments until melted. Sir after each increment. Once chocolate is melted stir in remaining chips. Let stand for a few minutes and then stir until melted. Stir after each increment. Once chocolate is melted stir in remaining chips. Let stand for a few minutes and then stir until smooth. Pour over your baking board. Sprinkle remaining cranberries and M&M's on top. Refrigerate for at least one hour to set. To serve, peel bark off of baking board and break into small pieces. Store in an airtight container.